Since the beginning of the decade, climate resilient green economy strategies have been proposed in many African countries. One of the pillars of the strategies is the adoption and diffusion of various climate smart agricultural practices for improving crop and livestock production and farmer income while reducing greenhouse gas emissions. The effects of these innovations on household nutritional security, including gender-differentiated nutritional status, have hardly been analyzed. We examine the determinants of adoption of combinations of multiple climate smart agricultural innovations and their impact on different nutrition outcomes. We find that adoption of climate smart innovations increases dietary diversity and improves calorie and protein availability. These benefits increase with adoption of combinations of innovations, relative to adopting an innovation in isolation. Gender-disaggregation results suggest nutritional outcome differentials between male and female headed households due to both differences in household characteristics (including household resources) and differences in returns to resources. 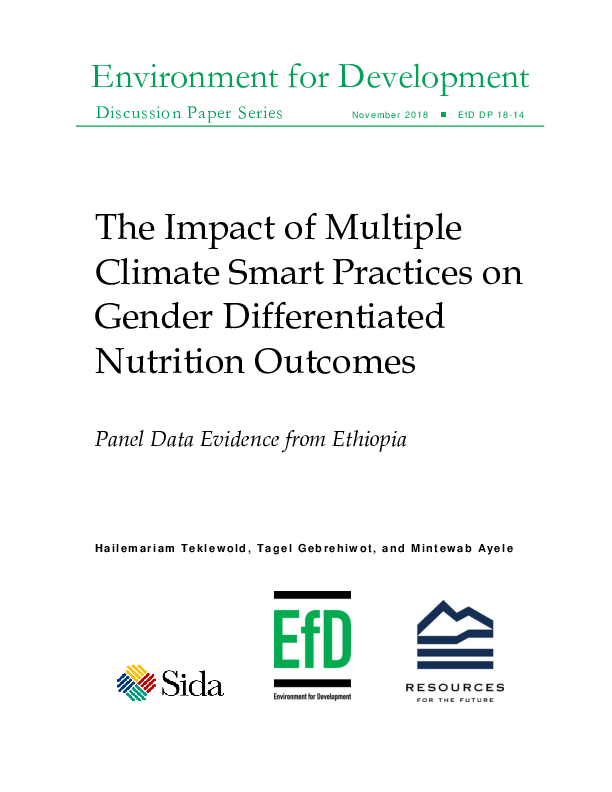 The study provides insight into the interaction between climate change adaptation and nutrition security among male and female headed households, with implications for the Sustainable Development Goals of ending hunger, achieving gender equality, and taking action on climate change.